Like the 2018 Toyota Corolla iM, the 2019 Toyota Corolla Hatchback is a five-door variant of the popular Toyota Corolla sedan and perfect for drivers who want versatility and increased cargo storage. The 2019 Corolla Hatchback is all-new for the 2019 model year and is replacing the outgoing Corolla iM in the Toyota lineup. Both vehicles share similar footprints, and the name change for the 2019 model year is likely just highlighting the transition from a bare-bones model to a feature-stacked yet practical counterpart that is more in line with driver demand. The 2019 Corolla Hatchback was recently released, and car shoppers will likely be able to find both the 2019 Corolla Hatchback and 2018 Corolla iM available at Toyota dealerships for quite some time. Like we mentioned above, the 2018 Corolla iM has a focus on budget and practicality and comes with features that drivers need for a comfortable and safe ride but not much more. It’s great for car shoppers who are most concerned about the bottom line and don’t need all of the frills traditionally found in a new vehicle purchase. The 2018 Corolla iM comes in just one trim level with a standard manual transmission or an optional automatic. 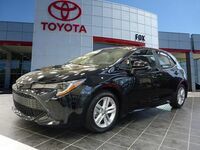 Standard features include LED daytime running lights, heated side mirrors with LED turn signals, dual-zone climate control, a rearview camera, split-folding seats, two USB ports, and the Toyota Safety Sense C bundle. The 2019 Toyota Corolla Hatchback with a manual transmission comes with a slightly higher starting MSRP than the 2018 Corolla iM, but we feel the price is fair considering it’s a small bump and comes with a long list of additional features including LED headlights, selectable drive modes, Apple CarPlay, Amazon Alexa, the Toyota Safety Sense 2.0 bundle, and more. Corolla Hatchback models with the automatic transmission add even more features including the all-new Adaptive Front Lighting System. Find both the 2018 Toyota Corolla iM and the 2019 Toyota Corolla Hatchback models available for test drive and purchase now at the Fox Toyota dealership in Clinton, TN.